One December evening in upstate New York, landscape painter Frederic Edwin Church stepped out to capture a twilight in watercolor. In a normal year the sky and icy waters on Chaumont Bay of Lake Ontario would have been lovely. But this year, 1883, the massive eruption of Krakatoa, thousands of miles away, made extraordinary the natural subjects that Hudson River School painters like Church worked with. Simon Winchester captures the historical moment like a painter himself–the tons of rocky dust that were thrown (some estimates suggest as high as 30 miles) into the air, much of which was too heavy to stay, “fell down as drifting veils of gray.” The softer dust that hung was swept “far and wide” in global wind currents unknown to science until then. These particles that stayed high above where rain could wash them out had profound visual effects. By “refracting and filtering and in a myriad of other ways altering so vividly the colors of the sunlight” the skies appeared to many beautiful in strange and wondrous ways. Church’s resulting Sunset over the Ice on Chaumont Bay, Lake Ontario holds this range of colors in the sky, “a gently intermingling play of pinks, mauves, orange, salmon, and purple that is quite astonishing, and unusual, and suggestive of something happening…high in the evening atmosphere.” The gorgeously odd skies lasted for months. Painters and poets continued making art inspired by the weird afterglows on the horizon, the color-changing moons, the swirly cloud streaks of a climate altered by a giant eruption. 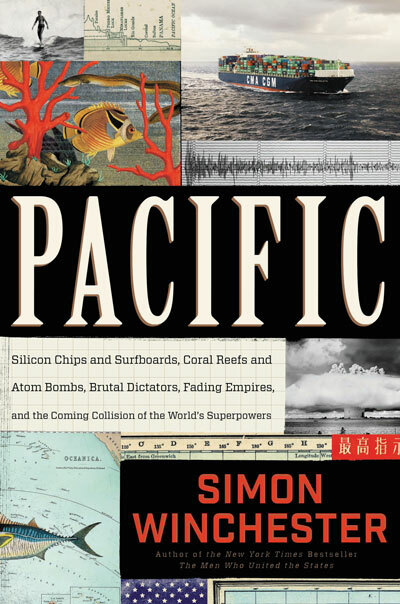 We are excited to have Simon Winchester in conversation with OPB at Wordstock: Portland’s Book Festival. The setting for this conversation is apt— the Portland Art Museum, which includes Childe Hassam’s 1908 impressionist painting of Mount Hood, can inspire visitors to contemplate the interplay of nature and art in today’s changing landscapes.